I’m at Yahoo for the OpenID/OAuth UX Summit. The room is packed with 40 or so folks. Companies with representation include Yahoo, Google, Microsoft, Facebook, MySpace, Plaxo, AOL, SixApart, JanRain, Vidoop, Chi.mp, and Magnolia, and projects including Internet2 and DiSo. 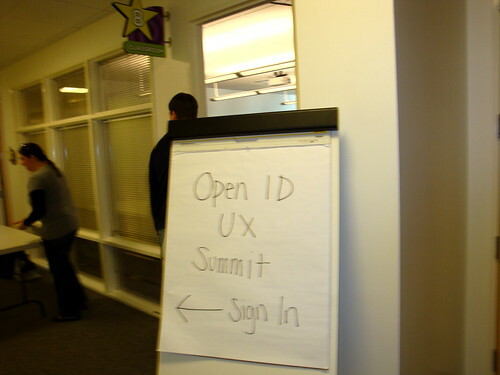 The Summit is a response to recent usability studies by Yahoo and Google that show the current state-of-affairs with OpenID and OAuth is quite poor, and we need together to find a user experience for the “open stack” that works for consumers. I’ll be sharing observations over the course of the day. First up: Facebook’s Julie Zhuo, sharing experience from Facebook Connect. 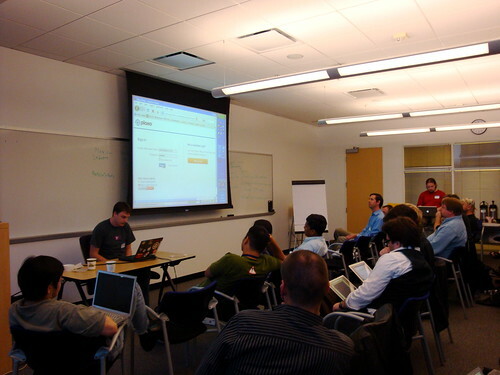 Idea originated in 2006 with the Facebook API. Initial version didn’t have any flow back to Facebook. Clunkiness of UI. One question for the Facebook Connect UI: How much text is really needed? Showing evolution of the UI to address the fundamental question, “What is Facebook Connect?” Final version includes user’s profile photo (if user is logged in), and thumbnails for both Facebook and the site user wants to connect. Good discussion about what usability revealed, about informed consent and user confusion, and about whether this passes EU privacy laws. (Answer: yes.) Facebook research showed that users had little or no understanding or savvy about phishing and URLs. By the way, I have to say it — great to see not only is Facebook attending this “open stack” summit, but that they’ve got four people here (including Dave Morin, Josh Elman, and Mike Vernal) and leading the opening session! That’s awesome. Now talking about the Connect Button. First version had tagline “Bring your friends,” but users didn’t know it was a button. Second version said “Register.” Third version said “Connect” and experimented with the user’s profile photo on the button. Final version is just the Facebook “f” and “Connect” or “Connect with Facebook”. Discussing logout options: unified, per-site, hybrid. Unified is secure, but unintuitive. Per-site is intuitive, but not necessarily secure. Chose unified out of security. Question for the future, if Facebook Connect takes off, may be strange to log out from one site and be instantly logged out of Facebook and all other Connect sites. A good laugh, as Joseph Smarr suggests a slightly more complex alternative. Julie says, “But then you’d make the user have to think.” Joseph’s aside, “That’s spoken like a true mainstream consumer site.” Incredibly active session. Key takeways slide: streamlined login is important. Explain what is going on. Err on the side of security. Flexibility is important. Next up: Max Engel of MySpace. “The Hybrid Login: OpenID and OAuth.” MySpace will support OpenID, OAuth, and a hybrid of the two. Will use a pop-up iframe. Allows the user to stay in context. Max is showing screens of the experience they are planning. Every MySpace user has a vanity URL, which will be their OpenID. Still trying to figure out whether to support logging with just “MySpace.com”. Key design elements will be similar to Facebook Connect. Data types: content, address book, registration, profile, friends, activity. Big laugh as Max shows the original OAuth screen, that has so much fine print that it looks like it was designed by a lawyer! Lots of discussion about whether email address should be passed to the site. Why it matters: not just for communicating, but also to avoid duplicate account problem Plaxo has experienced as an OpenID Relying Party and Yahoo OpenID. Chris Messina advancing the idea of email address as OpenID, something under consideration for OpenID 2.1. Max revisiting that MySpace Data Availability originally was to have zero cacheability of the data, which was not going to fly with anyone. Now planning a “portable profile” plus some cacheable MySpace-specific data. Allen Tom of Yahoo raises the point that the “cacheable” data is all on public pages already, so why not just mark it up with microformats and remove the caching restriction. “If Relying Parties don’t get the data they need, OpenID only creates complexity.” Max just mentioned Portable Contacts in his presentation. Drink! So many tough questions about complexity and confusion vs. simplicity but lack of clear, informed consent. Good discussion about whether participating sites can use the profile data they pull in to do targeting (including ad targeting). Facebook team says that they allow the site to use the data for targeting on the site, but not to redistribute the data (to an ad network, for example). Makes sense. Rising chorus for coming together to develop a common UI spec for OpenID. A call for five volunteers. 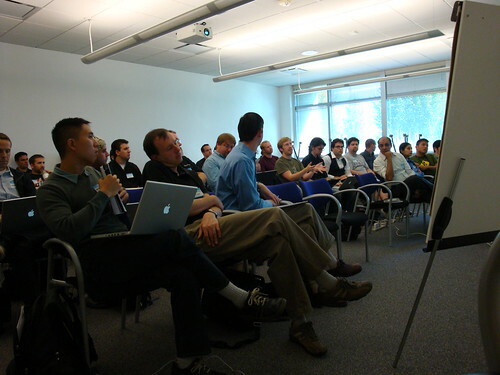 Hands raised include Chris Messina (Vidoop), Joseph Smarr (Plaxo), Eric Sachs (Google), Max Engel (MySpace), and, drumroll, Julie Zhuo (Facebook). That’s great! Next up: Allen Tom of Yahoo. Over 300 million users have an OpenID from Yahoo. Question shouted, “How many have used it?” Answer: “It has exceeded our expectations.” 😉 But, yes, we’re all here because we know we need to improve the user exerience. Launched BBAuth in 2006. Showing “Find Friends” on Facebook and LinkedIn, using BBAuth. BBAuth and OAuth is to grant long-lived credentials to third-party sites. “Cannot allow weaker credentials to be used to mint stronger credentials.” Talking about various security considerations. Login screen must never be framed. Anti-phishing sign-in seal must always be displayed. Allen now showing the “scary screen” which users are shown to approve access via BBAuth. *Lots* of small print legaleze. “Based on the feedback on BBAuth, we changed our approach on OAuth, which is what we’ll be using going forward.” Now, been spending a lot of time looking at and talking through the OAuth permissions screen. Allen now showing and talking about Yahoo’s implementation of OpenID. It is *much* improved over the version they went out the door with (shrinking 14 steps to two). Allen shares that “machine-generated” OpenID URLs have proven *way* more popular than user-selected. Surprised reactions. Talking now about Plaxo’s experience as an OpenID Relying Party. The business rationale, the philosophical view, and the admission that OpenID experience is not yet today a clear net positive to the key metrics. But Plaxo remains optimistic that the situation can improve dramatically with what’s being discussed here today. Next up, Magnolia’s Larry Halfft. They’ve used OpenID as a key part of their strategy to reduce spam accounts and have been generally pleased with the results. Now, Eric Sachs of Google, who just showed what I think is the first public demo of Google as an OpenID Provider. Giving context: SaaS vendors get asked to be a SAML RP for enterprise IDPs. In parallel, Google Checkout folks had questions/issues with login. Giving examples of login on Buy.com and Amazon.com, as an inspiration for a new/better? login experience for OpenID/OAuth. Now the challenge of desktop apps and OAuth. Seems like “No, help me sign in” is the key verbiage of this new “LSO” login model Eric is advocating. Now Google Accounts vs. accounts for Google AppsForYourDomain. Downside to this LSO login approach is that it does not work well for IDPs who are not email providers. Lots of good-natured joking as we try to do a demo, that requires a Windows computer with .Net and IE as the default browser. Not easy to find in this crowd! It’s 3:00pm. We’ve now finished the formal agenda and are discussing how folks would like to organize the last two hours. It’s almost 4:00pm. Joseph Smarr of Plaxo is demoing the “Open Stack” end-to-end stuff that was developed by JanRain for the Portable Contacts Summit. OpenID, OAuth, XRDS-Simple, and Portable Contacts working together to enable simple and secure sign-up with access to user’s profile and address book. Good discussion underway. Joseph now explaining XRDS-Simple and answering a lot of questions. Chris Messina now leading a discussion about the proposal to extend the OpenID spec to allow email addresses as OpenIDs. Mike Jones of Microsoft asserts this creates a major security vulnerability. Discussion underway. Some discussion of how to handle if the Provider site is down. Mike Vernal of Facebook responding to that question vis-a-vis Facebook Connect. Good response. 5:15. That’s a wrap. What a great day. The UX working group got a bit larger at the end, which is good. Eager to see what they come up with! That would have been me at the back of the room calling “what do you call that”. But I don’t like the answer I got. “The Open Stack” might also stand for, say, Ethernet plus TCP/IP. Or OpenOffice on Linux. It is not descriptive enough. Thanks for the post John – wish I was there too. Really great to see the FB guys participating in the Identity open space. Looking forward to seeing more information coming out in emails and blogs about the things that everyone agreed on and about what’s next. Johannes, Sorry the answer was not satisfying. With all things like this, the market will decide. My bet, as one of the few marketers in the room, is that “open stack” has staying power. Praveen and Edwin, you are welcome. Yes, let’s all hope that the next steps move the ball forward! Great post, I feel I’m there. As a site owner, removing the barrier to entry (registration) is a big deal. We just launched Facebook Connect on Govit. Check it out at http://www.govit.com. To early to give numbers for it’s success, but so far I like the FB Connect experience. Great post, it’s always interesting to read these sorts of liveblogs to see the perspectives of those in attendance. I am curious regarding the “major security vulnerability” concerns voiced Microsoft re: the potential use of email addresses as OpenIDs. Much of the discussion we’ve had at Vidoop points to this to be a major potential win for the adoption of OpenID, but as I mentioned, it’s valuable to see the impact from another perspective. And of course I’d be interested in hearing others’ thoughts as well. Thanks for the play-by-play John! Wish I could have been there. Indeed, thanks for sharing this.. Too bad all these events are always so far away. Is there a place where this conversation is ongoing after the summit? Thanks for the post – most useful. Never will understand why people *still* think OpenID needs to be “extended” to support email addresses when it *already* supports email addresses. Try entering a Yahoo.com email address into any OpenID2 login form. Bam.